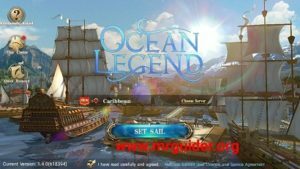 Ocean Legend is a brand new sailing adventure MMORPG by Oasis Games Limited in which you control your own ship in the open sea and battle against pirates, robbers and trade goods. Check out our Ocean Legend guide, tips, and cheats to play Ocean Legend game like a pro captain! Ocean Legend is a new sea battle game for mobile devices by Oasis Games Limited. There are plenty of activities you have to do in this game such as trading, battle against enemies, complete missions, increase the power of ship, recruit crews, explore the open ocean and find out unknown ports. In this post, we have covered everything about the game; Ocean Legend guide, cheats, tips, and strategy to play like a pro! As usual, Ocean Legend game starts with a tutorial in which you learn about the basic of the game; how to play Ocean Legend, about battles, missions, trading, and much more. If you did not take the tutorial seriously, then don’t worry, we have added the basic of this game here. The Basic – Your primary task in this game is to earn the profit. You purchase goods from a port and sell to another port at the high price. At the beginning of the game, you have a huge amount of silver coins, you can use it as the investment. In Ocean Legend, investment is one of the main tasks. If you invest in a specific port, you will get the advantage(read the investment guide below). Additionally, you have to take care of your ship; you can build more ships, upgrade ships or remake ships(read the ship guide below). The more you play the game, the more you learn about it. Let’s start the Ocean Legend guide, cheats, tips, and strategy. In Ocean Legend game, one of the main tasks is trading. Your objective is to purchase the goods at the low price and sell at the higher price on another location. After the tutorial, you will find yourself in the port. The main buildings in the port are; trading site, pub, shipyard, governor’s house, and church. Tap on the trading site. At the bottom-right side, there are two options; purchase or sell. Tap on the purchase option to purchase the good. After it, choose the good you want to purchase and confirm the order. Your ship has limited capacity to hold goods/cargo. Now, you have goods. Go back to the port screen. It’s to time sell the goods. First of all, we have to exit the port. How to exit the port in Ocean Legend game? Tap on the dock-side -> tap on the navigation button -> navigation. Now, you are out of the port, in the sea. It’s time to visit a port. At the top-right side of the screen, tap on the mini-map and you will see ports; Barcelona, Genova, Bastia, and many more. Go to these ports. To enter a port, go close to it and then tap on the message “tap to enter the port”. After it, go to the trading site -> sell -> sell your goods at the higher price. Ocean Legend cheats, tips -> The base price of each good in Ocean Legend game is of 100%(you can check the ratio in the trading site, at the time of purchasing the goods). After every half an hour, the ration of goods gets updated. To make more profit, purchase the goods at the low ratio(below 100%/base price) and sell to another merchant at the higher ratio(above 100%/base price). In this part, we will learn about the ships in Ocean Legend. You can build ships, upgrade ships, and you have to maintain the ship status. Go to a port -> tap on the shipyard side(At left side) -> remake -> at the right side, choose the ship; Japanese Ship, Arabian Ship, Caraveue Sailing Ship, and there are many available. If you have enough resources, it will show you “prominent” option. Tap on it to buy the ship. Now, how to use newly purchased ship? Go back to the port screen -> at the top-right side -> tap on the ship icon -> head to equip tab -> at the right side you can see all the ships you have -> to equip, select the ship -> participate -> set as flagship. That’s it. 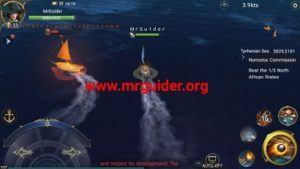 Ocean Legend Cheats, Tips, And Tricks -> To increase the stats of a ship, you need to level-up it. To level-up a ship, you need EXP. You earn EXP by completing the missions, trading, and battles. Equip the ship wisely, because only that ship will get benefit which is equipped by you/flagship. You can recruit crews at your ship. If you appoint them on an effective slot, you will get the bonus. For instance, Appointing Florez at the controller slot increases the Negotiation wave SFX and success rate. How to know the perfect slot? It’s easy. Tap on the + icon at the bottom-left of the screen -> crews -> tap on a crew -> just below the name, you can see in which job he/she is proficient; assault captain, controller, or more. Tap on the appoint option -> choose a slot. You can recruit new crews using silver coins. Additionally, you have to maintain the ship status; supplies, crews, and fatigue. Supply status determines how long you are able to sail. Crew status determines the speed of the ship. Fatigue status determines the unhealthy or week crews. How to maintain? To avoid fatigue or reduce fatigue, go to a port -> pub – > have a drink -> confirm. You should keep the fatigue status at 0. You can check this status at the top-left of the screen, near ship icon. Enter a port(read the guide above how to enter the port), go to governor’s house -> port investment -> at the bottom-right -> choose the quantity -> confirm. 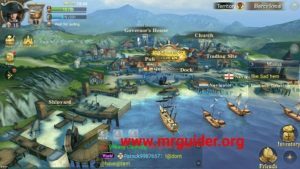 Ocean Legend cheats, tips -> Since you have limited silver coins, it would be better to choose a specific port; if you invest in all the ports; you will lose all your coins and it will hurt trading. Choose the popular ports; Barcelona, Genova, Cagliari. You can activate bonus such as durability, damage, and reduction using prestige. After a certain level, this feature gets unlocked. It is called “Nobility”. Tap on your avatar(At top-left corner) -> head to nobility -> you will see all the info there. Look at the mini-map, go to unknown ports, enter these ports and earn exploration prestige. In short, discover new ports. As you progress through the game, new skill gets unlocked. You can use these skills to deal more damage to the enemy ship. Upgrade these skills to improve their stats and deal more damage. Go to character’s info -> skill -> one-click level-up. All you need to do is complete the missions, invest in ports, trade and earn money. Level-up and unlock new features, ships, goods, and much more. Ocean Legend is a fantastic game.